Explanation: Spiral galaxy ESO 137-001 hurtles through massive galaxy cluster Abell 3627 some 220 million light years away. The distant galaxy is seen in this colorful Hubble/Chandra composite image through a foreground of the Milky Way's stars toward the southern constellation Triangulum Australe. As the spiral speeds along at nearly 7 million kilometers per hour, its gas and dust are stripped away when ram pressure with the cluster's own hot, tenuous intracluster medium overcomes the galaxy's gravity. Evident in Hubble's near visible light data, bright star clusters have formed in the stripped material along the short, trailing blue streaks. Chandra's X-ray data shows off the enormous extent of the heated, stripped gas as diffuse, darker blue trails stretching over 400,000 light-years toward the bottom right. The significant loss of dust and gas will make new star formation difficult for this galaxy. A yellowish elliptical galaxy, lacking in star forming dust and gas, is just to the right of ESO 137-001 in the frame. While this is a great picture, I'm nevertheless a little disappointed. I may be wrong here, but I think this is a repeat image from 2014. I know that Sundays are repeat days at APOD and I'm fine with that - Robert Nemiroff and Jerry Bonnell need a day off too! - but I don't expect Saturday's images to be repeats. 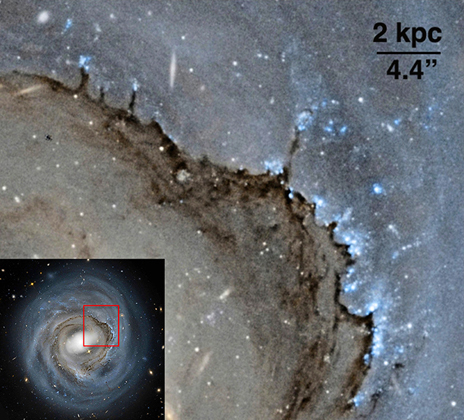 Leading edge of NGC 4921. Photo: NASA, ESA and Roberto Colombari. I very much hoped that today's image would show us NGC 4921. While the picture is not strictly new - it's from 2013 - there's been a brand new, fantastic study of it by Yale astronomer Jeffrey Kenney. NGC 4921 is a galaxy undergoing ram pressure on its leading side as it moves through the hot gas of the Coma Cluster, which creates fantastic "pillars of creation". In the 1990s, a famous Hubble photo dubbed “Pillars of Creation” showed columns of dust and gas in the Eagle Nebula that were in the process of forging new stars. The dust filaments Kenney identified are similar in some ways to the “Pillars of Creation,” except they are 1,000 times larger. The emphasis in the quote is mine. Last edited by Ann on Sat Aug 01, 2015 5:55 am, edited 1 time in total. I'm trusting it was an oversight but rather well caught if I do say so! It takes a lot of stars to make a piano. Any thoughts on what gave this thing the mighty boot ? the Big Bang ? ta152h0 wrote: Any thoughts on what gave this thing the mighty boot ? the Big Bang ? The Big Bang has nothing to do with it. Rather, NGC 4921 is on the outskirts of the Coma Cluster and it is "falling in" towards it due to gravitational effects. Or it might possibly just be in orbit around the center of the Coma Cluster. Whatever the exact reason, the Coma Cluster is filled with hot gas, and NGC 4921 is moving through this gas and feels the pressure of it like a steady headwind. Certainly ESO 137-001 is also either falling in towards a galaxy cluster or is in orbit around a galaxy cluster. I think it is more likely that it is falling in towards a great center of gravity. An interesting example of a rather nearby galaxy undergoing ram pressure is the small Virgo spiral NGC 4402. It is falling towards giant elliptical galaxy M86. 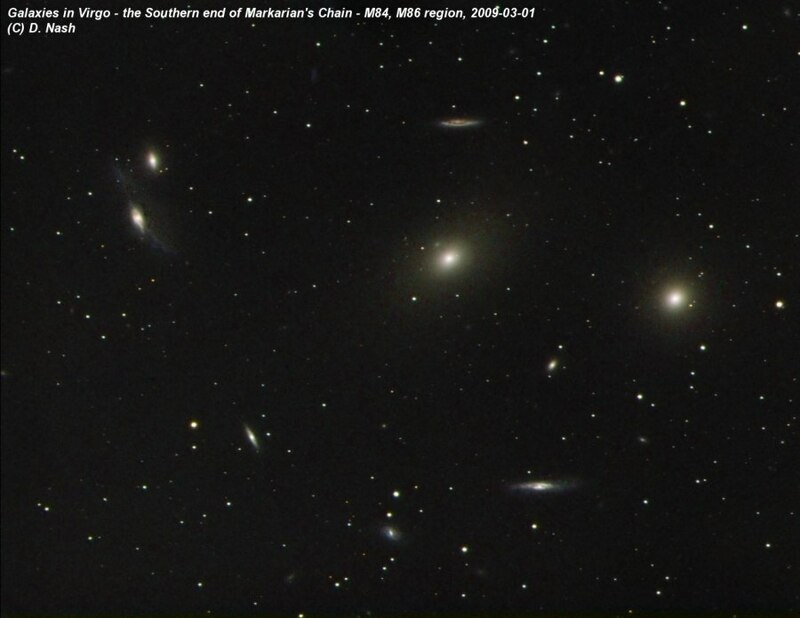 NGC 4402 is at 1 o'clock in the link to the Virgo Cluster image, and M86 is below it. Non-scientific, but as soon as i saw it, i thought of a humongous jellyfish type being that Captain Picard once came across and set free. Great picture!! One was hoping that someone would have explained this very question! <<Two spectacular tails of X-ray emission have been seen trailing behind a galaxy using the Chandra X-ray Observatory. A composite image of the galaxy cluster Abell 3627 shows X-rays from Chandra in blue, optical emission in yellow and emission from hydrogen light -- known to astronomers as 'H-alpha' -- in red. The optical and H-alpha data were obtained with the Southern Astrophysical Research (SOAR) Telescope in Chile. At the front of the tail is the galaxy ESO 137-001. The brighter of the two tails has been seen before and extends for about 260,000 light years. The detection of the second, fainter tail, however, was a surprise to the scientists. 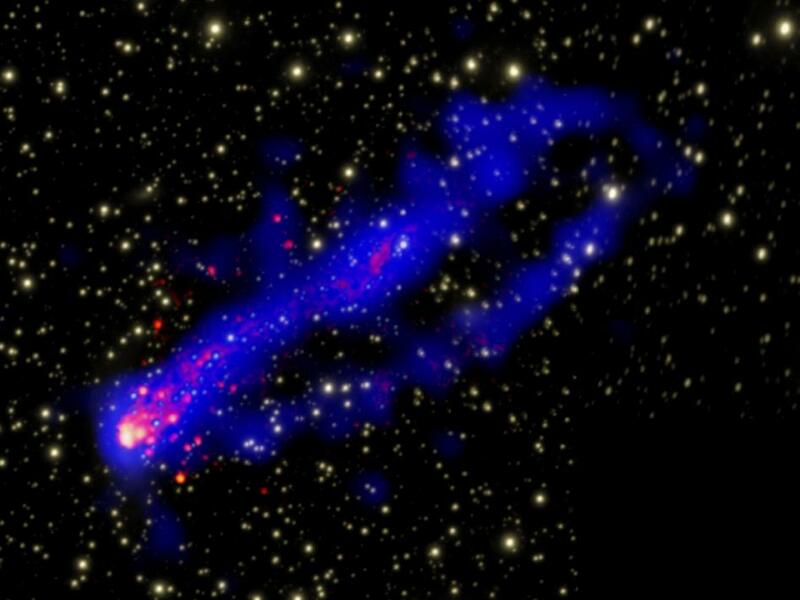 The X-ray tails were created when cool gas from ESO 137-001 (with a temperature of about ten degrees above absolute zero) was stripped by hot gas (about 100 million degrees) as it travels towards the center of [The Norma Cluster]. What astronomers observe with Chandra is essentially the evaporation of the cold gas, which glows at a temperature of about 10 million degrees. Evidence of gas with temperatures between 100 and 1,000 degrees Kelvin in the tail was also found with the Spitzer Space Telescope. <<Norma is a tragedia lirica or opera in two acts by Vincenzo Bellini with libretto by Felice Romani after Norma. It was first produced at La Scala in Milan on 26 December 1831. In the concerted finale, Norma pleads with Oroveso to spare her children (Deh! non volerli vittime / "Please don't make them suffer"). Sky & Telescope also has a current online story about the pillars in NGC 4921. Sometimes these pictures are for the benefit of us regular dolts and not for the bigger-brained individuals. I had not seen it before so don't care about the disappointments of the elite. We had recently listened to a very informative astronomy lecture from the archives of Gresham College by Professor Carolyn Crawford about galaxies, which added to our enjoyment of this image. Educational and beautiful as well. That's a very interesting article, with fine illustrations. Thanks.